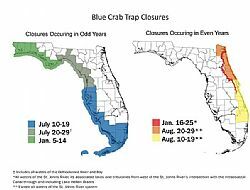 Southwest Floridians who like to boat, fish or catch crabs should be aware that the state will be closing the blue crab trap fishery briefly in July and will be out cleaning up derelict crab traps. The July 10-19 event will involve removing discarded traps and those lost or abandoned in disrepair from Southwest Florida's mangroves, back bays and passes. The effort will happen with staff and volunteers from Florida Sea Grant, UF/IFAS County Extension, State Aquatic Preserves and other organizations. "This applies to commercial crabbers who are well informed about it and recreational crabbers, who we have noticed historically didn't know about this regional blue crab trap fishery closure. So we want to make recreational crabbers aware that they need to pull their traps and inform boaters who frequent our waterways," said Joy Hazell, Florida Sea Grant Agent. State law says tampering with a trap that doesn't belong to you is illegal unless it's during a state-approved cleanup. The idea is that every other year the trap fishery will close for 10 days and everyone will pull their traps so the staff and volunteers can identify and remove all derelict traps found in public waters during the closure. The effort will help reduce marine debris in the estuaries.